On Monday, May 9, the planet Mercury will pass in front of the sun. Are you ready to watch it? Start preparing now for one of the major astronomical events of 2016: On May 9, Mercury will pass across the face of the sun in a rare sight. From time to time, the inner planets, Mercury and Venus, pass between Earth and the sun and are visible as tiny black dots on the sun’s face. Because their orbits are tilted at different angles from that of the Earth's, such transits do not occur very often, and those who want to watch these events should use specialized telescope equipment. 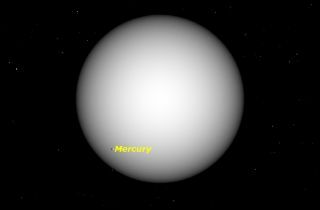 Because of Mercury's smaller orbit and faster orbital speed, transits of Mercury are much more common than transits of Venus, occurring 13 or 14 times a century. I personally have observed three transits of Mercury (plus two of Venus): in 1960, 1999 and 2003. After the transit on May 9, the next one will be in three and a half years, on November 11, 2019. There will be 10 more transits in this century. The transit of Mercury on May 9 will begin just after 7 a.m. EDT and will end just before 3 p.m. The exact times for any location will vary slightly because of parallax effects. Use a planetarium program like Starry Night to get more exact times and to learn the position angle on the sun’s face where Mercury will first appear. Any attempt to observe the sun can be dangerous, and should only be attempted by observers who have the proper equipment and are aware of the dangers. Any telescope can be used to observe the sun, but it must be equipped to deal with the sun's immense heat and light. My preferred method is to use a full-aperture solar filter. These are made of either glass or plastic, and they have a metallic coating that reflects away 99.99 percent of the light and heat falling onto them. Such filters must be of high optical quality, and the coating must be made specifically for solar observing. Solar filters are available from most telescope stores, but usually must be ordered in advance to fit the front of your particular telescope. Most filters today are made from AstroSolar film, which is manufactured by Baader Planetarium in Germany. They use a polyester film with excellent optical properties that are better than glass, and are coated with a metal layer that is neutral in color. It’s important that any solar filter be firmly attached to your telescope. If it should slip off, you would be blinded instantly. I particularly like the filters manufactured by Jim Kendrick, because they attach with three nylon thumbscrews that securely lock the filter in place. These filters are made to order, and must be ordered several weeks before the event. There is also an older method of observing the sun that requires no equipment other than a telescope: eyepiece projection. To use it, a viewer must throw the telescope's eyepiece slightly out of focus in order to project an image of the sun onto a screen a foot or two behind the eyepiece. This has the advantage of allowing a group of people to observe the sun simultaneously, but it always makes me nervous, because the beam of light emerging from the eyepiece is intensely hot and dangerous. Think of the sun’s rays concentrated by a superpowerful magnifying glass. Never use the so-called sun filters that are sometimes included with inexpensive telescopes and are placed near the telescope’s eyepiece. These are prone to cracking in the intense heat, and when that happens, the user is blinded instantly. Even with proper equipment, Mercury can be hard to see, because it is so small compared to the size of the sun. I observed the transit of 1999 with an 80-mm refractor, and found that I needed a magnification of 67x in order to see Mercury; it was too small to see at 45x. The most interesting parts of a transit are the first few and last few minutes, as Mercury enters and leaves the sun's disk. When Mercury is just inside the edge of the sun, it is often seen to be connected to the dark sky by a thin, dark thread, called "the black drop." This is now thought to be an optical illusion, but it is still worth observing closely. For me, the most exciting thing about observing a transit is more aesthetic than scientific. To see a tiny world silhouetted against the mighty sun gives a striking view of the scale of the solar system. Mercury's disk is just 1/160 of the diameter of the sun, and looks like a tiny, intense sunspot. If you don't have a solar telescope of your own, check out your local astronomy club, museum or science center. Many of these places will be offering observations of the transit to the public, and will provide the proper equipment. Editor's note: If you safely capture a view of the 2016 transit of Mercury on May 9 and you'd like to share it with Space.com and our news partners for a story or gallery, send images and comments in to managing editor Tariq Malik at spacephotos@space.com.